"ROUSH Performance is a name synonymous with aggressive, well-built, powerful Ford vehicles. But it isn’t just ROUSH Mustangs that we create – meet the 2017 ROUSH F-150." The 2017 ROUSH F-150 builds on Ford's new aluminum-bodied F-150 truck, and enhances it with a host of body components, ROUSH graphics, and a ROUSH Side-Exit Exhaust System. Interior components include ROUSH Molded Front and Rear Floor Liners from WeatherTech, and a serialized ROUSH console badge to document the F-150’s ROUSH bloodlines. 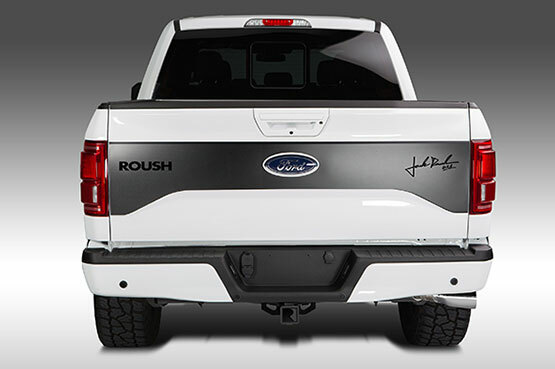 ROUSH has gone to great lengths to enhance the appearance and functionality of the ROUSH F-150's exterior, with race-inspired body components, graphics, wheels, and grille work. ROUSH exterior upgrades are precision-engineered with CAD/CAM design and manufactured using the same processes that major automotive manufacturers use for OE-quality appearance, longevity, and fit. At ROUSH Performance, delivering heart-pounding performance, unparalleled refinement, and race-inspired styling isn't enough. We take our commitment a step further by backing the 2017 ROUSH F-150 with an industry-leading 3-year/36,000-mile limited warranty.